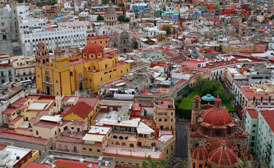 Guanajuato is immensely popular with Mexican tourists visiting the area due to its historic relevance and past. These make up 95% of the state’s tourists. The rest from other countries but, over the past few years, increased interest from abroad is slowly increasing the amount of international tourists to the state. The three main cities for tourism are of course the capital city of Guanajuato, Dolores Hidalgo and San Miguel de Allende. The state has about about 75 hotels ranked of three, four or five star standards along with motels and quest house, especially in the historic quarters of the city. Guanajuato is visited for its supreme colonial architecture and its role in Mexico’s rich cultural history, particularly during the War of Independence. Likewise, San Miguel has cultural and historical treasures. 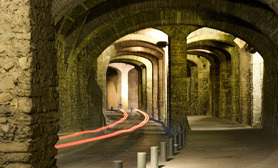 Both cities have been designated World Heritage Sites and, not without cause. 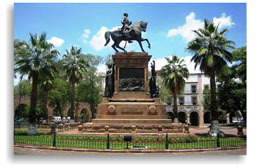 While not a World Heritage Site, Dolores Hidalgo is particularly important as the site as it is where Miguel Hidalgo y Costilla gave the orders called “El Grito” which commenced what is now known as the Mexican War of Independence. 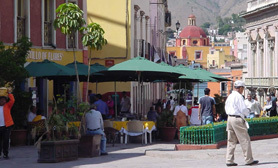 The state’s tourism sector have set up sightseer routes such as the Ruta de Independencia, Ruta de Aventura (Aventure Route), Ruta Arqueológica (Archeological Route), Ruta de los Conventos (Monastery Route) and Ruta Artesanal (Handcrafts Route), all of which are extremely popular with Mexicans living in Mexico and those Mexicans who live abroad and wish to rediscover their country´s diverse history.